Claim your tax credit for the purchase of qualifying energy efficient shades. Certain Hunter Douglas Duette® Architella® honeycomb shades may qualify for a U.S. Federal Tax Credit of up to $500! 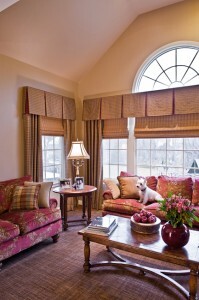 The federal tax credit is valid on qualifying honeycomb shade purchases made from January 1 through December 31, 2011. You can still purchase before Dec. 31 to qualify for the tax credit. – Purchase any qualifying energy-efficient Hunter Douglas products within the following collections: Alustra® Duette® Architella® honeycomb shades with certain fabrics and options. – Fill out the Hunter Douglas Manufacturer’s Certification Statements and take it along with your sales receipt to your tax professional to determine your eligibility for this tax credit. DECORATING TIP: Further enhance the beauty of your windows and also reduce your heating and cooling bill by adding lined and interlined drapery panels with a top treatment. For more information or to purchase Hunter Douglas products or Custom Window Treatments contact Pamela Kofsky of Elegant Interior Designs at 215-920-9655.